The genuine turbine outlet diameter is small which causes the secondary exhaust pressure to rise. This in turn results in a loss of power, response & unstable pressure. 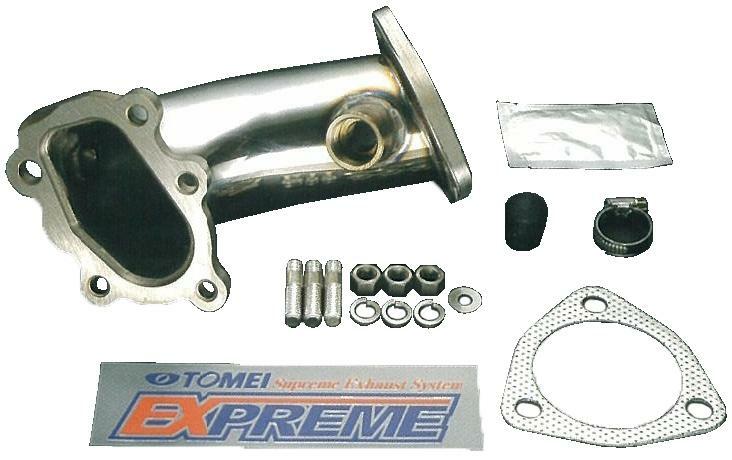 The Tomei outlet has a larger internal diameter for the best optimization of exhaust flow efficiency & helps reduce the exhaust pressure substantially. If used in conjunction with our Tomei ARMS turbine. You will see large gains in all aspects of performance. The corrosion-resistant stainless steel material used in manufacturing this product is good with heat resistance up to the flange. The SUS304 material properties have strength, light weight and good rust resistance for both the flange and pipe. Without impairing mid range torque, the f73.2mm diameter type delivers best output results at high RPMS. The high intensity lost wax productions method was used to minimize any exhaust leak from the flange. High quality pipe bends and production methods were used with superb welding of the flange to deliver the best possible product to you. Improved turbine response & a decrease in anti- lag pressure whilst on boost. Highly accurate welding, improved reliability & good looks.